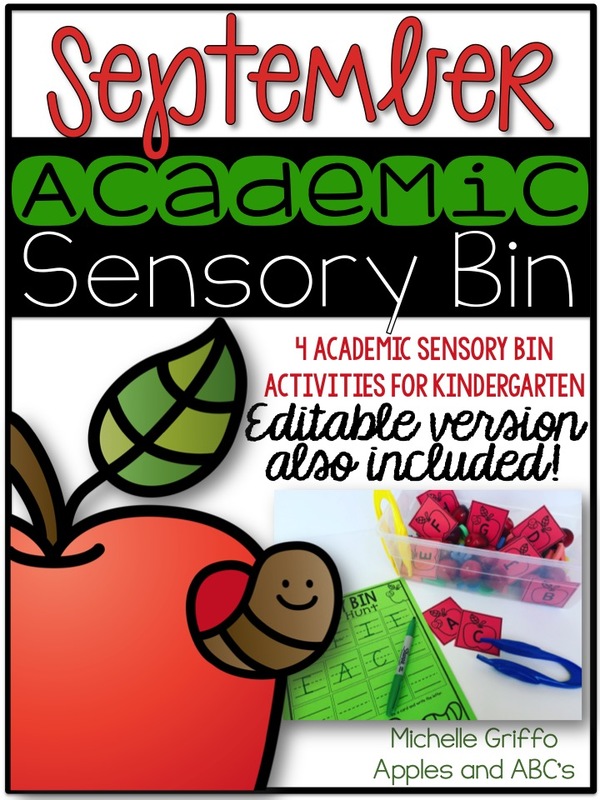 For the last 5 years, I have been using sensory bins in my classroom. Sensory bins are really popular among stay at home moms, and are often used with toddlers to encourage them to explore new objects and materials. I love incorporating them into the classroom because 4 and 5 year olds still need that tactile exploration as well as academic rigor. 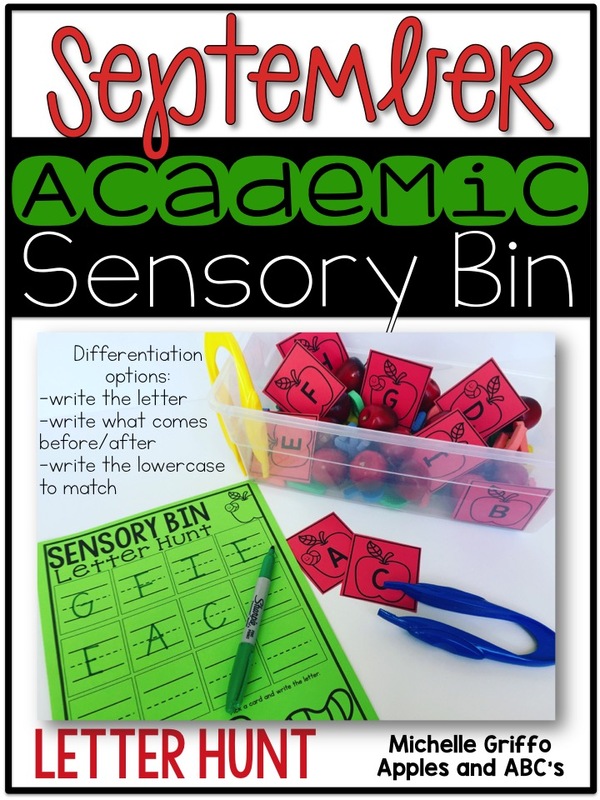 ;) I decided to compile the resources that I use in my classroom for you to use in your classroom as well! I would like to introduce September Academic Sensory Bins. There are four different games included and one EDITABLE game as well, so you can make your own game for the students. The first activity is a letter hunt. The students pick a letter from the sensory bin, and write it down on the recording sheet. For differentiation, you can have the students write what letter that comes before/after or write the corresponding upper/lowercase letter. Next I want the students practicing number recognition. I included numbers 1-16, normally we just focus on numbers 1-5 in September, but I wanted to give you more options if you need it. 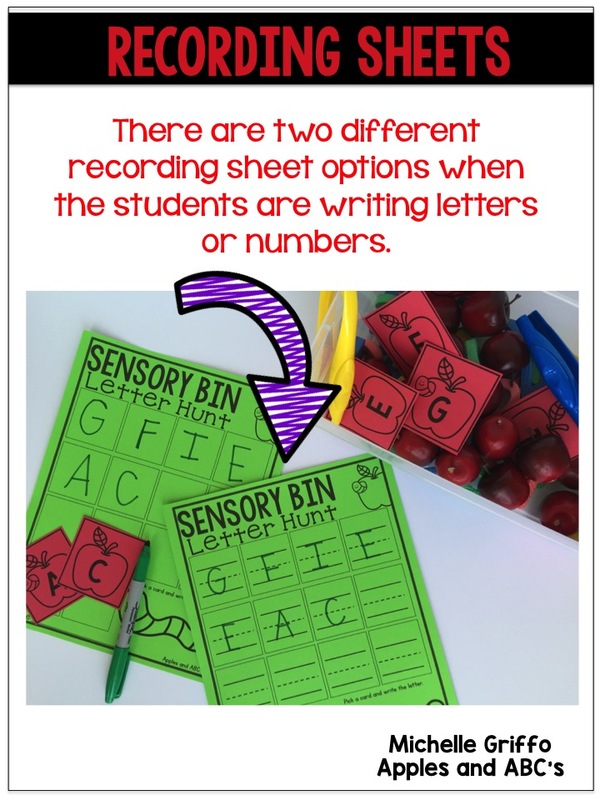 I included two different recording sheets for the letter and number sensory bins so you can choose if you want a blank square or lines for the students to write on. My favorite back to school topic is practicing color awareness. 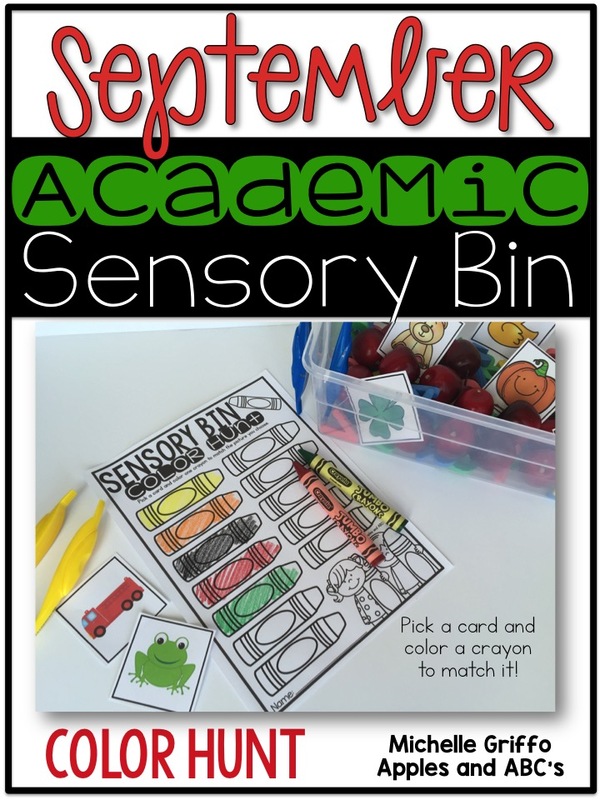 This activity allows the student to pick a card, then color a crayon to match the color they picked. This also comes with black and white picture cards if you want to test their color awareness. Another back to school skill is practicing shapes. For the first month of school we focus on just a couple of shapes. This activity has the students practice recognizing shapes. The students pick a card, and then color a corresponding shape in each box! 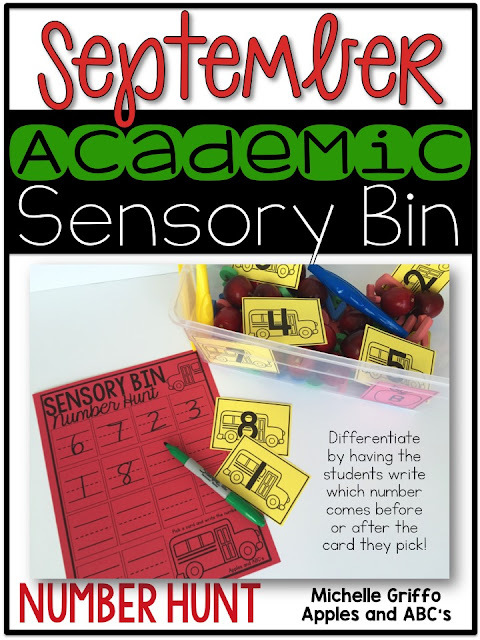 My favorite component of this sensory bin resource is that I made an editable version just for YOU! 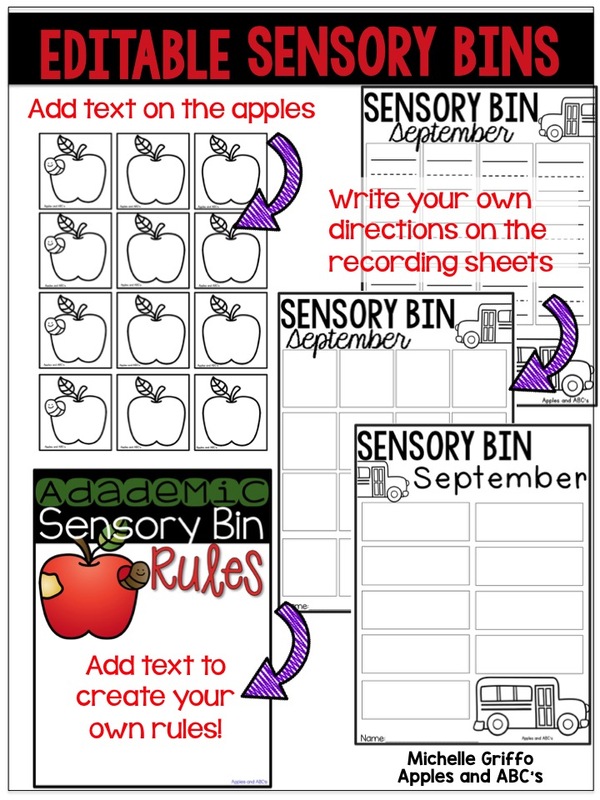 You can type your own text into the apples, and write your own directions on the recording sheets. I have the printables in PowerPoint and you can type directly on them! 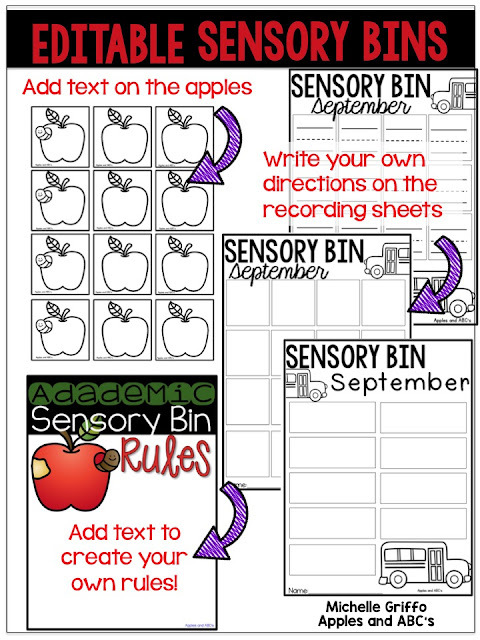 I also included a page for you to type your own sensory bin rules! 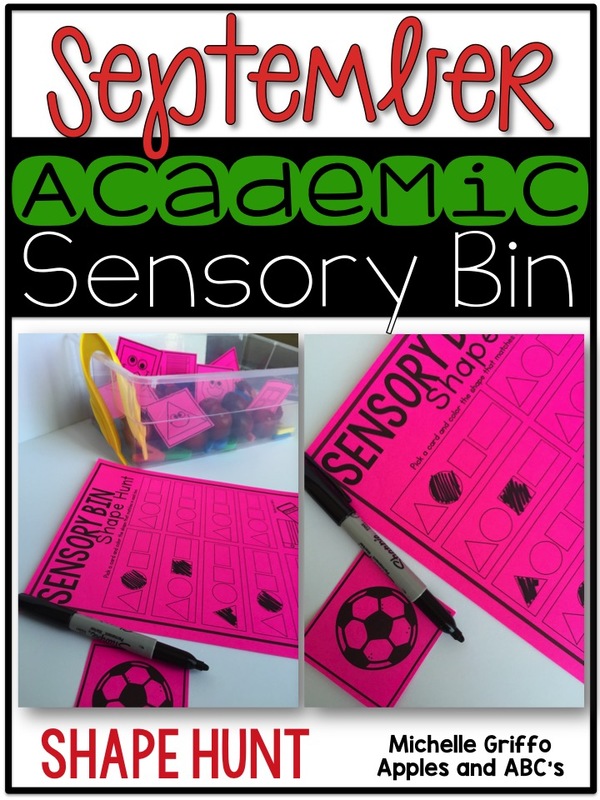 I would use this resource to write the students' names and have them write them down for practice! Grab it at a discounted price HERE! Cool and informative article! I remeber my September 2016! It was my last September in college and lots of writing assignments were given to us. You know, when you don't get used to the intensive load, producing writing assignments becomes difficult and stressful! For such purposes, I have the best British writing service. Now, I can cope with everything independently as soon is my graduation and the academic load is not that intensive. Soon, I will officially become a graduate and an active job seeker!